I’m an artist. Actually, I’m a sculptor, and there’s nothing I like better (with a few exceptions) than being totally engrossed in making a piece of art. One of the questions many people ask when they see a piece of work is “How did you think of that?” and then “I think it looks like…” Often their interpretation has nothing to do with the original intent of the piece, and I’m always fascinated with their creative spins on the work. This summer at Lakedale, we started a new program we’re calling the Lakedale Sculpture Project and I, along with 2 of my favorite artist friends, have just completed the first of what we hope will be many land, lake, and air based sculptures that will add to the gorgeous Lakedale landscape. Titled Embark/Embrace, the piece is approximately 180 feet long, 20 feet wide and 8 feet tall, and meanders along the edge of Dream Lake, dipping in at one point and re-emerging farther down the lake. 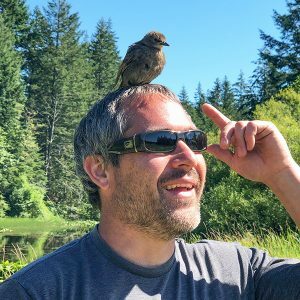 I thought I’d answer the question “How did you think of that?” with this post describing the process behind what it took to bring Embark/Embrace to life. Last summer, Janet participated in the Chicago Tree Project where she met artist Anthony Heinz May, whose sculptural practice centers around wood, and whom she thought would be a great addition to our team. In January, the three of us discussed our visions for what the piece could be, where our areas of expertise lay, and how we thought we should proceed. Based on our schedules, we would shoot for the last week in June to fabricate the sculpture and in the meantime, come up with some conceptual ideas. We agreed that the idea of a habitat, whether for animals, humans or a combination, could speak to the landscape and give us various options for construction. We also wanted to incorporate aspects of the unique ecology of the San Juan Islands into the piece. After Janet and I made a reconnaissance mission to the resort in March, the ideas started flowing. Land into water? Steel structure with rope? Funneling cocoons? Beaver lodge? We selected a site close to the General Store to allow guests to watch as the sculpture progressed, and determined we would use split rail fencing, which we have in many parts of the resort, as a primary material of the piece. Karl, Lakedale’s General Manager, gave us a great tip on a local sawmill, located nearby. 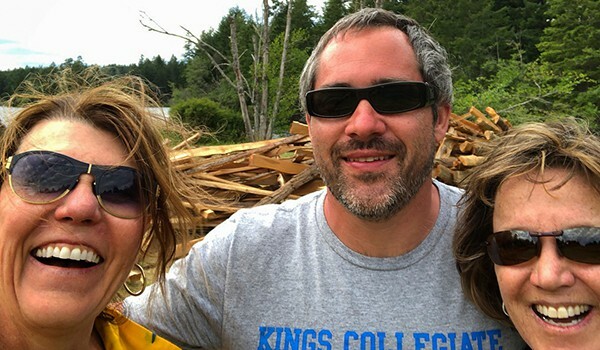 One drizzly afternoon, Janet and I drove over to meet Bill Maas, the sawmill’s owner, and were astounded at the sheer quantities of wood he had. Giant logs strewn about like tinker toys, bundles of cedar shingles piled high and pallets of split rail fencing were scattered over his 30 acres – in between several barns protecting dangerous-looking machinery – all meant to do something to wood. He was our man. Back at the resort, Janet and I staked out the shape of the piece we envisioned with steel rebar. 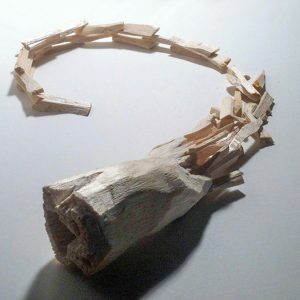 We had our wood source and a germ of an idea, so it was on to the drawing boards! Anthony reviewed our progress and took things to the next level with a sketch in early April. The shape of the piece would mimic the shape of San Juan Island turned on its side, and convey the sense of a tent, an iconic Lakedale campground feature. 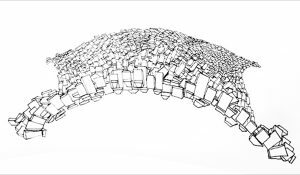 It would be supported by a steel substructure with lengths of split rail fencing sliding along the steel in random patterns. After agreeing with the concept, our only concerns were whether the sculpture could withstand potential guest interactions – meaning, would it collapse under the weight of numerous guests (possibly drunk) standing atop it? And could we finish in the span of 10 days? Back to the drawing boards, as they say. 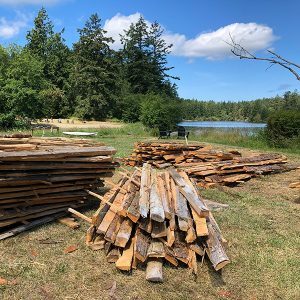 Within a couple of days, aided by images of the massive logs we’d seen at the sawmill, Anthony and Janet brainstormed another idea…that of using a large red cedar log felled on its side at the edge of a large body of water. As it extends out from the water, it would explode into large splintering shards of wood that eventually form into a split-rail fence, meandering and arbitrarily dividing land and water. The temporary trans-formation of the log into a fence will ultimately return to nature over time. Nature is only contained by nature, not by stewardship and regulation, as humans would prefer. Boundaries are arbitrary, as they signify division of being and existence, rather than pronouncing the universality found in the natural world. And no steel involved, except for a few screws. After seeing the drawings and maquette, Karl, Bill and the engineer were all relieved. It was a go. 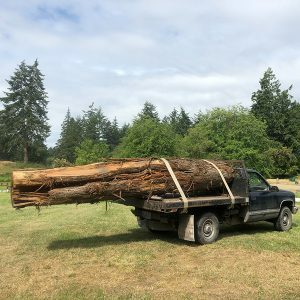 In May, I made another trip to the sawmill, and met with Bill, who had pulled aside 2 possible contenders for our “mother tree”, one of which was perfect. A 16-foot long, 4-foot diameter, 1200 pound red cedar log… a beauty. I ordered a pallet of split rail fencing, 1500 board feet in all, which we thought would be plenty of raw material to complete our concept, and Bill gave me a primer in constructing split rail fencing. I ordered a jug of the 3 1/2″ outdoor screws (300 in all) that Bill recommended for securing the split rails and felt like we were ready to begin construction. 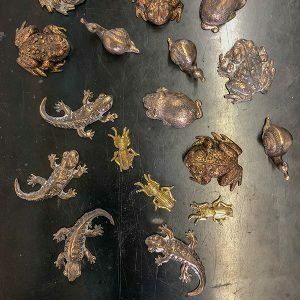 Back in Chicago, Janet was hard at work sculpting and casting small bronze animals found on San Juan Island that would incorporate the natural element we had discussed…western toads, voles, salamanders, snails, and beetles started jumping onto her workbench. One element I wanted to incorporate was a way for Lakedale’s guests to participate in the piece…a creative avenue to add to their own experience at Lakedale over time. Always fascinated with mushrooms, I thought tree fungi, which would organically sprout from our sculpture, would be a logical and easy way to do this. Maybe interlocking pieces that guests embellished in our activities tent and then added to the piece? 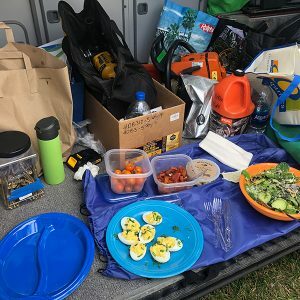 On June 20, Janet and Anthony arrived in Friday Harbor after a long day of east coast/west coast travel and we were ready to embark – eight days to make a great piece of art. Something that happens when making art is the unpredictable nature of the creative process and how large a part serendipity plays in creation. Working with three artists (each with an opinion or two) who’ve never worked collaboratively with each other before, might have been a challenging endeavor, but we were all excited with the outcome. 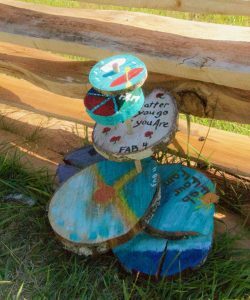 Please visit Embark/Embrace at the resort and participate in the work by adding your own “mushroom cookie” to the sculpture…and stayed tuned for news of the next Lakedale Sculpture Project. Click here to view the completed images of Embark/Embrace. We hope to see you soon! What is Glamping and Why Do I Want to Go?